The British-American Project for the Successor Generation, to give it its full title, was officially founded in 1985 – “to perpetuate the close relationship between the United States and Britain,” and in the words of BAP’s official history, through “transatlantic friendships and professional contacts”. Today, It has a membership of over “1000 leaders and opinion formers”, drawn equally from both countries. It was conceived in 1982 by Nick Butler, a Labour Party insider of the old right and a research fellow at the Royal Institute of International Affairs (known as Chatham House). It was funded by the far-right oil baron J. Howard Pew and launched by (neoliberal) US president Ronald Reagan and right-wing media baron Rupert Murdoch. The project’s greatest success was New Labour. One only has to think of a so-called liberal left-leaning political party cooking up lies such as the ‘dodgy dossier’ and using it to contribute to the killing a million innocent civilians – as it was in Iraq – such is the scale of their influence. In the years immediately before the founding of BAP, the early 1980s days of Tony Benn and CND, the Labour party was sceptical about America. In the late 1990s under Blair and Co, it was swallowing almost anything the US did, said and asked of it. But that has now changed with the arrival of Jeremy Corbyn. 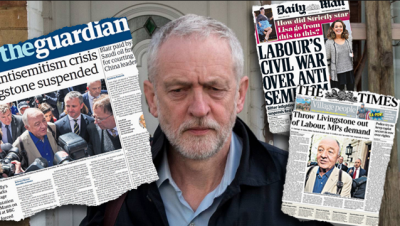 Yesterday’s so-called revelations in The Times (a Murdoch asset) about anti-semitism in the Labour party, completely debunked by shadow attorney general Baroness Chakrabarti, is yet more evidence of the ever more desperate measures being deployed to save Theresa May’s government imploding neoliberal government. In June 2016, Ruth Smeeth resigned her position in Corbyn’s shadow cabinet as Parliamentary Private Secretary for the shadow Northern Ireland and Scotland teams. This was part of more than 60 coordinated resignations from Corbyn’s shadow cabinet organised by plotters with the aim of precipitating a no-confidence vote and forcing his resignation. The plot failed. Access to a system where disinformation like Jeremy Corbyn’s anti-Semitism story can be promoted, in this case, comes via the British American Project. This could partly be because Ruth Smeeth is married to Michael Smeeth, a member of the executive body of BAP. 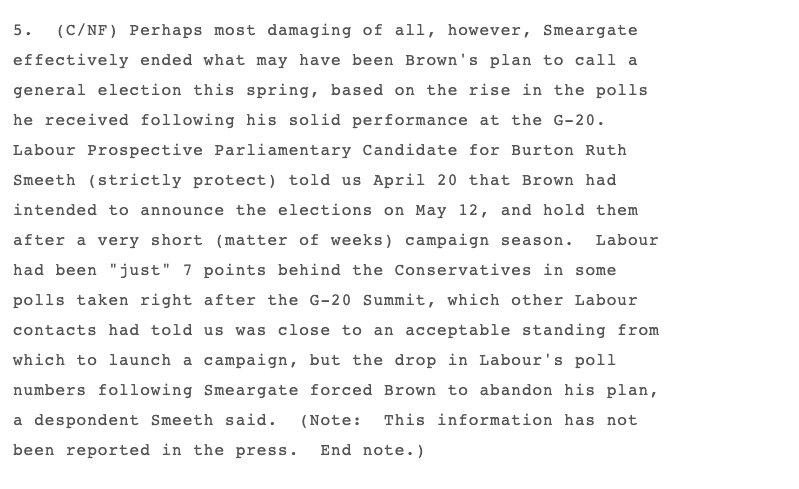 And as it turns out, joking may have been some sort of defence mechanism because it then transpired that Ruth Smeeth was, according to a Wikileaks cable – an intelligence asset of the United States. The cable testifies to the intimate connections that Labour’s plotters have to the US state and its intelligence agencies. And this is more than likely just the tip of the iceberg as is usual in cases such as these. For instance, global corporations are involved in BAP. Ruth Smeeth, is today, still right at the heart of the anti-semitism story. A quick Google search provides numerous mainstream media articles and never-ending hit pieces that roll on day after day. And so to summarise, a Labour MP, with proven deep connections to right-wing Israeli organisations, married to an executive of a right-wing think tank that was funded by Murdoch and other neo-con organisations has been trying to bring down Jeremy Corbyn who has sympathy with the plight of the working class and that of the Palestinian people in particular. For balance, even Howard S Stern, the author of the International Holocaust Remembrance Alliance definition of antisemitism (which the Labour party has endorsed) has spoken against constant unfounded slurs against Jeremy Corbyn. There is no doubt that in a party with over 500,000 members, the biggest in Europe, there are going to be those with views anathema to certain groups. And there is no doubt that antisemitism exists in the Labour party. But the same applies to all mainstream political parties and emerging voices on the right and left. For the Tories, it is a clear hatred of black people as Windrush demonstrates. For Tommy Robinson, it’s Muslims. For the left, it is conservatism, for the right it’s liberalism – the list goes on. Joel Stein, a well known American journalist wrote of BAP in a Los Angeles Times article after attending one of the ‘conferences’ as a potential member – “the British-American Project is a CIA front, a tool for converting Brits into neocons.” He also wrote that BAP was funded by huge corporations such as JP Morgan, UPS and BP, and Paul Wolfowitz (the architect of the New American Century that Bush/Blair used to blow up the Middle-East) is on the advisory board. The British American Project, with its clear links to the American government, current links to global corporations, to finance, the nuclear industry, healthcare, government, strategic intelligence and politics uses its influence and persuasion, ethical or not, to shape the political environment of Britain. Is it a stretch to say BAP is distorting Britain’s democracy? By the nature of the British American Project – it is obvious that Jeremy Corbyn and his vision of Britain’s is to be resisted at all costs. And so it is that this story, the story of Corbyn’s antisemitism that sits with the same falsehoods we are all immersed in these days in Britain. They are the slogans of division. Taking back control was a lie. Leaving the EU would be the easiest thing in the world was a lie. The reasons for attacking Iraq and Libya were all founded on lies. Climate denial is a lie. Trickle-down economics is a lie. We are being immersed in a disgraceful environment of political propaganda, disinformation and downright lies cooked up by those with vested interests and promoted by the billionaire offshore owners of the press and fellow travellers such as Ruth Smeeth and contriving organisations such as BAP. Little wonder that this very day, according to an alarming new study from the Hansard Society that more people in Britain would now favour a populist ‘strongman’ – an authoritarian to rule the country because faith in our democracy has now reached a new low never witnessed in Britain’s long history!